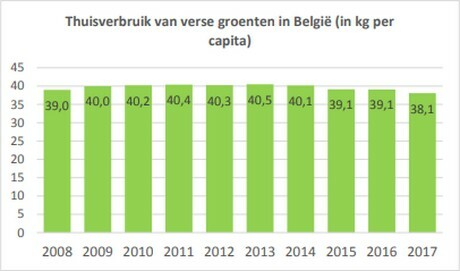 Last year, the average Belgian bought 38kg of fresh vegetables. This is a kilogram less than in 2016. A higher average vegetable price means spending stayed on par. The home use of fruit rose slightly from 46,6 to 47kg per capita. Fresh fruit was 4% more expensive last year. This increased spending on fruit by 5%. Thanks to inflation and the higher average price of fruit and vegetables, expenditure in their whole category increased from EUR212 to EUR219 per person. Organic fruit and vegetables won ground last year, but its growth has leveled off. The number one product in people's vegetable baskets was 'the tomato', closely followed by carrots. Only bell peppers and mushrooms gained ground within the top ten here. The most popular fruit was apples, with the Jonagold in the lead. These were significantly more expensive. They could, however, not maintain their volumes. They also lost market share to, in particular, bananas. Strawberries had a good year, and their volumes, as well as spending on this product, rose. There was very little change when it came to sales. 'DIS 1' stores fell slightly from 49 to 48% market share. It remains as a strong market leader, followed by hard discounters with 24%. In third place, neighborhood supermarkets rose from 14 to 16% of the market share. VLAM learned all this from the figures the marketing research bureau, GfK Belgium, collected from its panel of 5.000 Belgian families. Since 2008, buying fresh vegetables for home use has fluctuated between 39 and 40kg per capita. However, it decreased last year with 1kg to 38,1kg. Vegetable prices rose from an average of EUR2,44 per kg in 2016 to EUR2,51 per kg in 2017. This increase means vegetable spending of EUR95,69 per person remained the same. Almost all Belgian families buy fresh vegetables. They do so, on average, 57 times a year. This is one time less than in 2016. Flemish families and those in the higher social-economic group buy more vegetables compared to those from Walloon and middle to lower-income families. The difference in spending between the upper and lower social-economic groups increased last year. Within the fresh vegetable sector, pre-packed, processed vegetables continued to increase in popularity. It went from 3,6kg per capita in 2016 to 3,7kg in 2017. With this, this segment had a share of ten percent in volume and 17% in spendings. Organic vegetables grew less strongly last year than in previous years. Belgians buy, on average, 1,8kg of organic vegetables per year. The home use of fruit increased somewhat from 46,6 to 47kg per person. Fresh fruit was 4% more expensive last year which means spending came out 5% higher. Belgians spent an average of EUR122,76 in this category last year. Just as with vegetables, almost every Belgian family buys fruit. This happens, on average, 52 times per year, in other words, weekly. 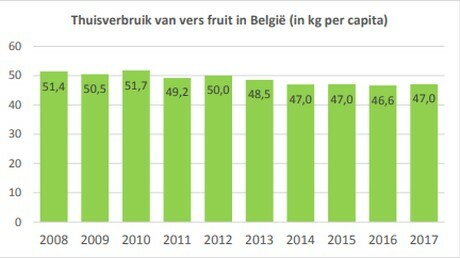 Flemish households are bigger fruit buyers than those from Walloon. Older families also buy more fruit than younger ones. Half of all Belgians buy organic fruit. The number of buyers in this category is on the rise. However, as is the case with organic vegetables, this sector grew more slowly last year than the previous years. The tomato remains in the lead within the vegetable assortment. Per capita, 5,6kg of this fruit is used at home. The carrot, with 5,6kg per person, and the onion, with 4,4kg per capita, follow. Within the tomato sector, cherry tomatoes, especially, have won long-term shares. This is at the expense of the normal tomato. The strong growers in 2017 included special mushrooms, Chinese cabbage, parsnips, Savoy cabbage, red beets, turnips, and mixed lettuce. The most notable fallers were watercress, lettuce, curly lettuce/frisée, oak leaf lettuce, and large endives. Within the top ten, bell peppers and mushrooms gained ground last year. The Flemish tend to buy more bell peppers, leeks, mushrooms, broccoli, cauliflower, Brussel Sprouts, and spinach. Those living in Walloon, on the other hand, spend more on onions, chicory, courgettes, lettuce, shallots, endive, and aubergines. People in Brussels like tomatoes, cucumber, and princess beans. Vegetables that appeal to younger families are tomatoes, carrots, bell peppers, courgettes, mushrooms, cucumber, aubergine, and different lettuce varieties. In contrast, older families instead choose chicory, leeks, cabbage varieties, lettuce, celery, shallots, and asparagus. The product found most in people's fruit basket is 'the apple'. Here, the Jonagold is most popular. This variety is considerably more expensive due to the failed crops. It could not maintain its volumes and lost more of its market share to, in particular, bananas. In 2008, the average Belgian bought 5,4kg of Jonagold, while in 2017, this was only 3,3kg. The Pink Lady, which has a less-successful 2016, grew in strength last year again. Strawberries had a good year. Their volumes and sales rose. Other important risers were blueberries, blackberries, watermelon, raspberries, and apricots. Pear sales fell. This fruit had a strong 2014 when consumers were called upon to support the country's pear production. This was following the Russian trade boycott of this product. Last year, pear sales fell to the 2013 level. The biggest droppers included prickly pears, all pear varieties, with the exception of the Conference, and Reinette and Granny Smith apples. Younger households prefer apples, pears, bananas, and melons. Older ones tend to buy more oranges, pears, peaches, and nectarines. in 2017, 48% of the volume of fresh fruit and vegetable volumes were bought at so-called DIS 1 (hypermarkets and larger supermarkets) stores. This is a percent less than in 2016. Hard discount stores, such as Aldi and Lidl have a 24% share in volume. After a yearly increase between 2010 and 2015, stabilization was noted for this sector in 2017. In the third place are the neighborhood supermarkets. This is the only sector that grew in 2017. It climbed from a 2016 14% market share to one of 16% in 2017. All the supermarkets together (Dis 1, Hard discount and neighborhood supermarket) achieved a share of 88%. Fresh fruit and vegetables are increasing becoming supermarket products. This is at the expense of markets, greengrocers, and direct sales. Another rising trend is meal boxes. These can be delivered at home or collected. This formula is popular with well-off singles and families with children. Almost 3% of Belgians have ordered at least one meal box. After the 2008 financial crisis, the growth of out-of-home consumption stopped completely. The tide turned in 2014, and consumer trust was regained. This led to the stimulation of the foodservice market, which grew by more than 2% last year. Saving time is vital to the modern consumer. They are looking for quick, convenient solutions (fast service, work, on-the-way, and so on). The experience is also very important. Nowadays, hospitality businesses that invest in creating a unique experience are at the top of the game. At home is, and remains, the most important place for consuming food, in general, and fruit and vegetables in particular. Of the total number of opportunities to eat, two-thirds take place at home. This is also true for vegetable consumption. Seven percent of consumption occasions that feature vegetables are with friends and families. The remaining times take place at work or school (10%), in classic restaurants (9%), and 'elsewhere (6%). 'Elsewhere' includes function venues, recreation parks, and Ikea restaurants. Lettuce and cucumber are eaten more outside the home. Leeks and courgette are products typically eaten at home. Fruit is eaten more often than fruit at home, work, or school. Of the fruit consumption occasions, 71% take place at home, 4% with friends and family. Seventeen percent happens at work or school. It is striking how low the hospitality industry's share in fruit consumption is. Only 1% of fruit-eating moments take place in classic restaurants. Kiwi, pears, and oranges are eaten more at home while apples are a winner at work.